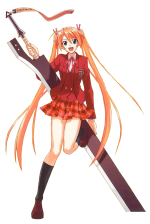 Asuna Kagurazaka is a character from Mahou Sensei Negima!. Negi Springfield has several Flashbacks about Asuna. One of them was when she was bathing him at the Mahora Public Bath in chapter 3 and the later one was when he saw her Skinny Dipping at Library Island in chapter 9. Asuna is seen Skinny Dipping under a Waterfall Shower and washing her arm. This page was last modified on 17 January 2016, at 15:57.